Some more photos of the Bay Farm Island Bridges. 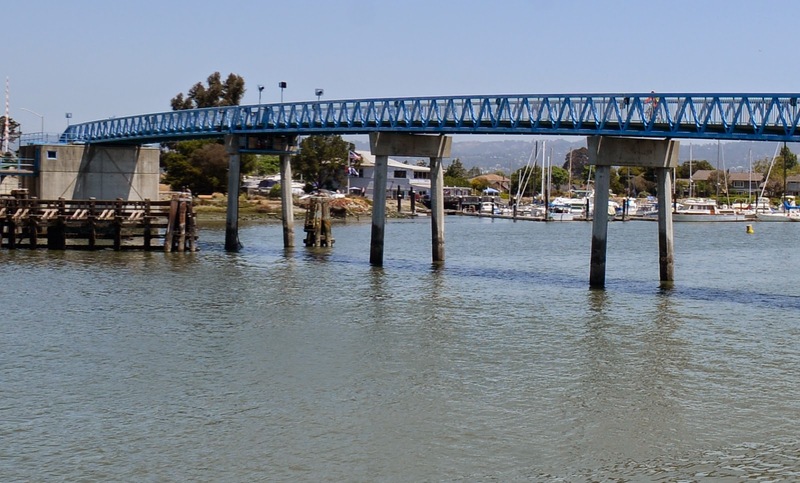 The bascule spans for both bridges are on the east side of the estuary. Wooden fenders protect the pile extensions along the narrow channel. The free end of the bascule span on the highway bridge is supported on a special bent with two rows of slightly battered piles. The free end of the bascule span on the bike bridge is supported by just another two column bent. The bike bridge has a long, continuous pony truss superstructure on slightly battered two column bents. Work started on the bridge in 1993 and it was completed in 1995. 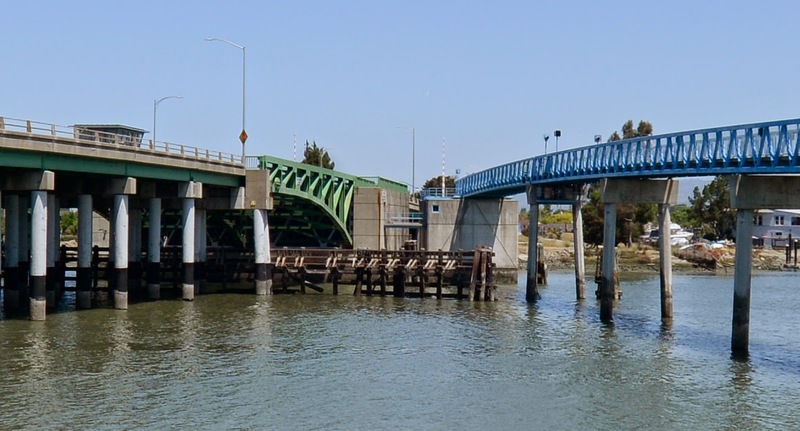 It cost $3.5 million with funding from Alameda County, Caltrans, and the federal government. The bike bridge automatically opens when the tender opens the highway bridge. However, the bicycle bridge can be opened manually if necessary. Unlike the other bridges which use gearboxes to open, the bike bridge uses two giant hydraulic pistons to open and close. The Bay Trail carries bicyclists and hikers from the bridge onto the Island. A timber bridge carries them under the highway bridge. Alameda County, California Bridges: Bay Farms Island Bridges (2) by Mark Yashinsky is licensed under a Creative Commons Attribution-NonCommercial-NoDerivatives 4.0 International License.